Featuring: Simon Yam, Tony Leung Ka Fai. 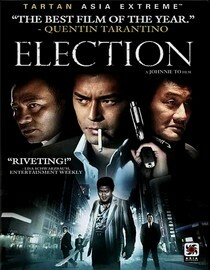 Director: Johnnie To. I'm not sure why but this movie is listed under the martial arts genre by Netflix. Maybe because it has Asians in it? Yes, there is some street-fighting but I didn't see any flying roundhouses anywhere. This is a straight up mob movie. Which is cool, because I like mob movies. The story revolves around a power struggle between two up and coming triads and is sparked when one of them is elected over the other. A battle erupts over who can control the baton that signifies who the leader of the triad is. Things go back and forth for a while, there are some unexpected developments and a really surprising and disturbing finale concludes the movie. I have sort of mixed-feelings about this movie. I was really unsure about how I felt about the movie until it was over. The important thing is that it kept me entertained throughout. At times this film seemed too frantic and confusing to keep up with and then all of a sudden it would slow down and show some of the brutal realities of what it means to be a person willing to kill to get what they want. One thing I will say, the director didn't stylize violence the way American directors tend to. The violence was there and it was brutally unapologetic. Anyone who enjoys mob movies should definitely check this one out and form an opinion of their own. In retrospect, I think I like this movie a lot more now that I'm reviewing it than when I was actually watching it. I didn't know what to think, but now that I know what happened in the end, I have to say I rather liked it. According to Netflix this movie will stop streaming on 8/18/11. Of course, sometimes they lie. Why is it in your queue? Cover looked cool. Is it artsy? No, but it is subtitled. For some that counts. What stood out the most to you? How much cooler Asians in suits smoking cigarettes look than the rest of us. What mood should I be in to watch this movie? When you realize you've run out of good American mob movies to watch but you still need a fix.